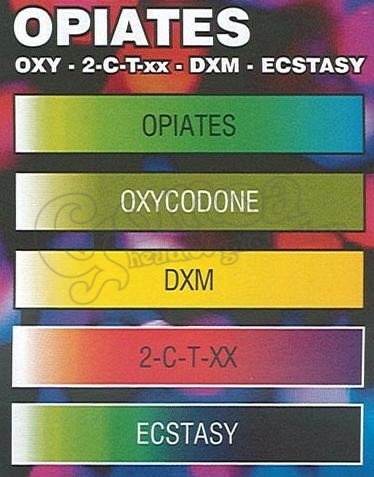 Drogtest for Opiates can be used to test for opiates as well as for Ecstasy (MDMA, MDA, MDE). Opiates presumptive drug identification field testing kits are NON diagnostic tests (not for medical use) that are sold worldwide to police, customs authorities and the general public. We highly recommend these tests for parents, schools and for the authorities, because they help detect illegal substances accurately. When the color is shown on the chart it means the sample contains saome of the substance indicated on the color shart. It does not mean the sample is "pure", there could be something else in it that was not detected by the test. It does not tell you how much of the substance is in the sample. Our drugtests neither condones nor condemns the use of any drug, but recognises the fact that illicit substances will be used regardless of their illegality. There is no such thing as safe drug use!